One of the actual cooking shows I like to watch on Food Network (yes, there are still shows that have chefs actually cooking recipes on there) is Brunch with Bobby. While I do not make brunch very often, I do enjoy a lot of the recipes that he comes up with, and they are perfect for use for breakfast or dinner for the three of us. Just recently, I saw an episode where Bobby Flay was making his take on chicken and waffles. I have done chicken and waffles once before a while ago, but I liked his particular take on it because it seemed easy and it looked like it would taste great. The key to making the recipe for me would be to find the time in to make the batter for the waffles, the soak for the chicken and then the time to cook it all. Luckily, I did have one day where I had some downtime from work and was able to fit it all in and gave it a whirl. For the waffles, combine the flour, baking powder, baking soda, sugar and salt in a large bowl. In a second bowl, whisk the eggs until they are smooth, then whisk in the buttermilk and butter until the ingredients are combined. Add the wet ingredients to the dry ingredients and mix just until the batter comes together; there will be lumps. Cover the dough and let it sit at room temperature for at least 30 minutes and up to 1 hour. Preheat the oven to 250 degrees. Set a baking rack over a baking sheet and place the baking sheet on the center rack in the oven. Preheat a waffle maker according to the manufacturer’s instructions and brush the plates with melted butter. For each waffle, ladle about 1/3 cup of the batter onto the iron. Cover the batter with the lid and cook the waffle until it is golden brown and crispy, about 3 to 4 minutes. As you go, transfer the cooked waffles to the baking rack in the oven and hold them there while you fry the chicken. For the fried chicken, while the waffle batter rests, place the chicken tenders in a resealable plastic bag. Add 1 cup of the buttermilk and the hot sauce, then seal the bag and marinate the chicken at room temperature for 1 hour. In a medium bowl, combine the flour with the garlic powder, onion powder, chili powder or cayenne, 1 teaspoon of salt and 1/4 teaspoon of black pepper. Transfer half of the flour mixture to a second bowl. In a third bowl, put the remaining 1 cup of buttermilk. Remove the chicken from the marinade and pat the pieces dry with paper towels. Sprinkle the chicken tenders with salt and pepper. Heat 2 inches of oil in a high-sided skillet, preferably cast-iron, set over medium heat until it registers 360 degrees on a deep-fry thermometer. Working in batches to avoid crowding the pan, dredge the chicken in the first dish of seasoned flour, then dip the pieces in the buttermilk, letting the excess drain off, and finally dredge the chicken tenders in the second bowl of seasoned flour, tapping off any excess. Fry the chicken until it is golden brown on both sides and just cooked through, about 5 minutes. Remove the chicken to a paper-towel-lined plate and season it with salt. For the maple syrup, bring the maple syrup and the softened butter to a boil in a medium saucepan set over medium heat. Stir in the bourbon whiskey or extract. Allow the syrup to simmer for 1 to 2 minutes until the flavors meld, and the syrup is warmed through. To serve, put one of the waffles on a plate and top it with a fried chicken tender or two. Drizzle the chicken and waffles with the warm syrup, or with hot sauce or honey, if you desire. 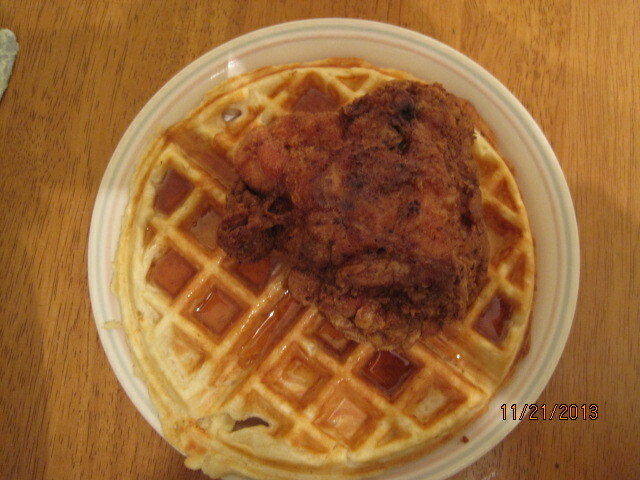 I have to say while I have not had a lot of chicken and waffles in my lifetime, this was the best recipe I had tried. We all agreed that the waffle batter was fantastic, producing perfect waffles with an incredible flavor from the buttermilk and just the right amount of crunch. My waffle maker is a Belgian waffle maker, so the waffles were bigger, but you can cut them down to size if you like. The chicken tenders were the ideal size and portion for the meal, in my opinion. I always found a big piece of chicken with the waffles to be too filling, but the chicken tender was perfect. I liked the coating and double coating the pieces produced an excellent crust on the chicken. The syrup, which I got the recipe for from Food.com, was a nice touch to round out the meal. It was sweet and tasty, and this recipe makes a good portion of syrup, so you are likely to have some leftovers to use for another occasion. All in all, this was a good choice that makes a nice meal for dinner or brunch. Sean has been asking me to make this one for a long time and I am not really sure why. I tried to tell him that chicken and waffles is just what it sounds like – fried chicken with some waffles. For some reason he really wanted to give it a god so I tried to find a recipe that specialized in both. You could simply just take your favorite fried chicken recipe and any waffle recipe and go to town if that is what you wanted to do, but I found this recipe from Emeril Lagasse that was easy, basic and made really good chicken with some spice to it and very tasty waffles to go along side of them. To make the Essence seasoning, combine all the dried herbs thoroughly and store them in an airtight container. For the chicken: Heat enough vegetable oil to come about 1-inch up the sides of a large, deep cast iron skillet. Heat the oil until a candy thermometer inserted into the oil registers 350 degrees. Rinse the chicken pieces under cold water and do not dry; leave the pieces wet. In a large, sealable plastic bag, combine the flour and the Essence seasoning. Add the chicken pieces one at a time, seal the bag, and shake the coat the chicken evenly. Remove the chicken and place it on a wire rack set over a baking sheet. Repeat this process until all the chicken is coated. Allow the chicken to rest on the wire rack for 5 to 10 minutes. Carefully add the chicken to the hot oil and fry, turning once, until the chicken is golden brown and the meat is cooked through, about 15 to 20 minutes total for the pieces being cooked. Do not overcrowd the skillet and cook the chicken in batches if necessary. Remove the chicken pieces from the pan and drain on paper towels. Place the cooked chicken pieces on a wire rack set over a baking sheet and place in a 250 degree oven to keep them warm while you finish cooking the rest of the chicken. For the waffles: Preheat a waffle iron and lightly spray it with cooking spray. In a large bowl, sift the flour, baking powder, sugar and salt. In a separate bowl, beat the eggs and add the butter and buttermilk and beat to combine. Add the wet ingredients into the dry ingredients and mix them well until combined. Pour the batter into the hot waffle iron and cook until the waffle is golden brown and lightly crisp. Remove the waffle and repeat the process until all the batter is used or you have the desired amount of waffles. Top each waffle with a slice of butter, if desired, and serve with the chicken and maple syrup. It certainly is an interesting combination if you have never had it before. The crispy chicken along with the crispy waffle and the maple syrup make for a tasty dish. I did not use a cut up fryer but only bone-in chicken thighs that I had on hand to make things a little bit easier. you could use whatever type of chicken pieces you prefer. For the Essence seasoning, the recipe makes about 2/3 cup, so you will have some leftover to use for other meals as a rub or seasoning. You could always just use whatever you like most on fried chicken instead and you can even buy your favorite waffle mix and use that if you did not want to make your own. I think it was certainly easy enough that it would warrant making again and it was different to try. Sean seemed to really enjoy it. This recipe made 4 servings, so it was just enough for the three of us with some leftover fried chicken that we can use for other meals. That’s all I have for today. Check back next time for some more recipes. I still have a few Thanksgiving items to post, including another turkey recipe I am trying, so stay tuned. Until next time, enjoy the rest of your day and enjoy your meal!